Box welded pond liners are increasingly becoming the preferred option, this eliminating ugly creases when trying to fit a 2 dimensional Pond liner in to a square or rectangle hole. As the name suggests this service offers a bespoke Pond liner cut and welded to the exact shape of your new pond, no more creases or unwanted folds to harbour waste or debris allowing unwanted pathogens to cause water quality problems. 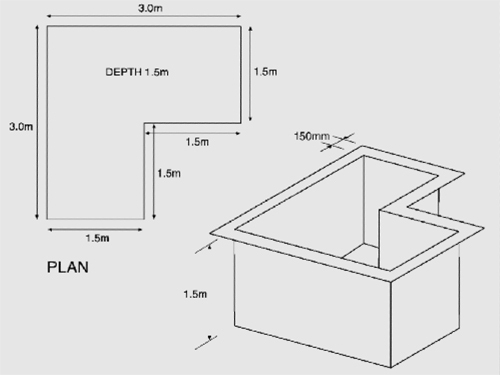 Box welded liners come with a standard 150 mm (6”) lip which lays flat on the last layer of blockwork, its important however to remember to have the pond full of water allowing the liner to sit correctly before laying the copings to secure the liner in place. Obviously the tailoring process works best with formal shapes such as squares, rectangles, L-shapes or even circular ponds with vertical sides, we wouldn’t recommend having any shelves in your new ponds as this will cause havoc with water flows and debris collecting unnecessarily. Whilst many other designs can be tailored contacting: enquiries@absolute-koi.com during the planning stages would confirm suitability and help eliminate those features, which can add, allot of expense for very little benefit. Quotations for the simpler box welded pond liners can be given by simply emailing your dimensions all we need is the length, width or the diameter as well as the total depth together with the size of the lip required (150mm (6") is standard) we will then give you a no obligation quote.